I can’t believe this year has come to an end. It’s kind of surreal looking back and thinking back to all that has happened in just 365 days. This #photoaday thing is really awesome to look back on and document the big moments as well as the little things in life. Although I struggled and found it more difficult to keep up with as the year came to an end, I’m thankful to have stuck with it, even if I had to play catch-up a few times here and there. 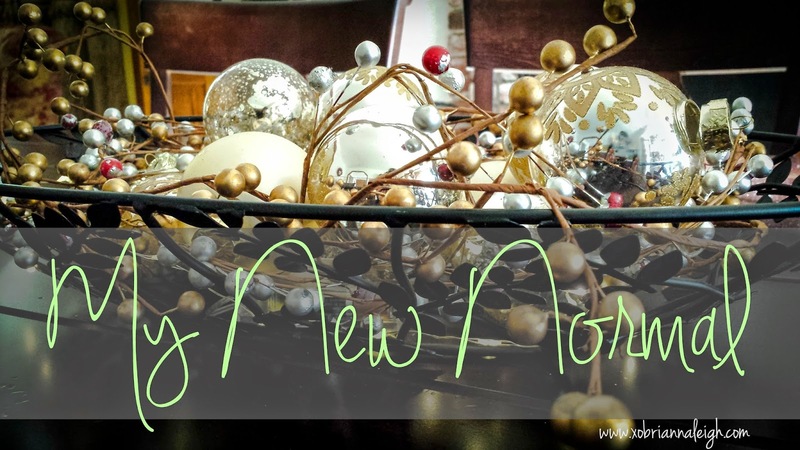 Regardless, here’s to the end of 2015 and a brand new beginning as 2016 shines upon us! Day 359: Merry Christmas! Because Texas and 80 degree weather calls for shorts and shades! He’s doin it right. Day 360: The dog whisperer strikes again! These four crack me up. Day 361: I’m in (puppy) love with these two! Day 364: Because when you’re sick and feel miserable but you’re hungry, you obviously go for the chicken and dumplings! Day 365: The last sunrise of 2015. 365 | 365. It’s here – the closing of a chapter and the turning of a page. Thanks for sticking around and following along as I chronicled my year! It was the holiday season. I had two weeks off from both jobs, and I was headed home to spend some time with my parents who just so happened to be hosting a Christmas celebration or two. And I was in the mood to put their spectacular kitchen to good use! 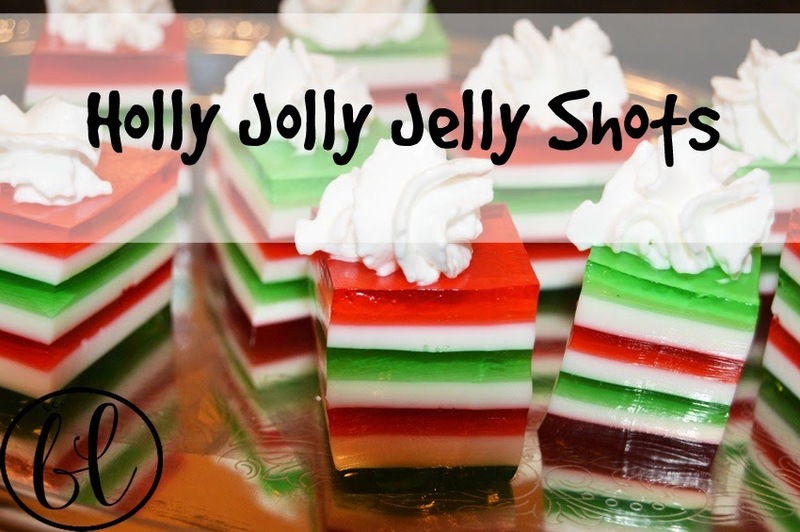 Enter: holly jolly jelly shots. Thanks Pinterest! 1. Coat a square dish with cooking spray and wipe out with a paper towel. I almost used a rectangular 9×13 dish but it definitely wouldn’t have turned out very well, so I highly recommend using a square one for this! I used an aluminum square pan and it worked perfectly. 2. 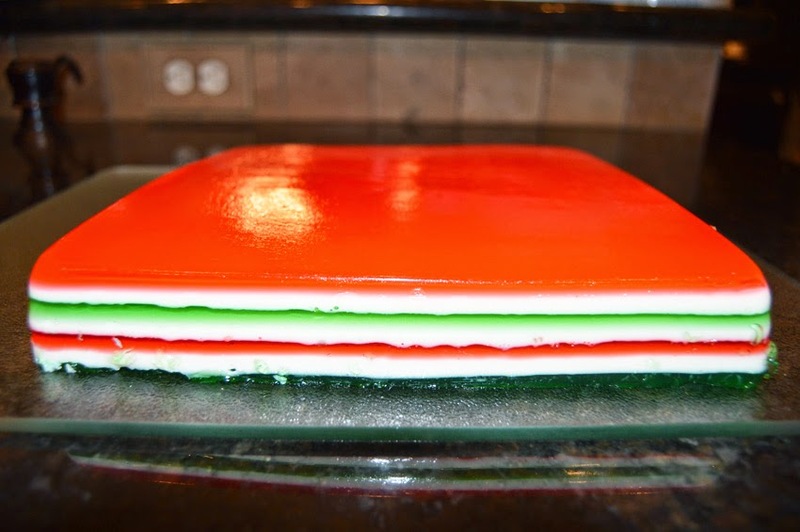 Combine ingredients to make your three layers: red, green, and white. This would totally work for other holidays as well. For Valentine’s Day, just do red and white layers…it’s up to you and the options are limitless! St. Patty’s day, green and white. And so on. I found that mixing each color in a large liquid measuring cup worked really well! The red and green will make about 2 cups of liquid, and the white will make 3 cups, so use measuring cups sized accordingly! Sprinkle half an envelope of unflavored gelatin over 1/4 cup of water. Allow it to soak for a minute. 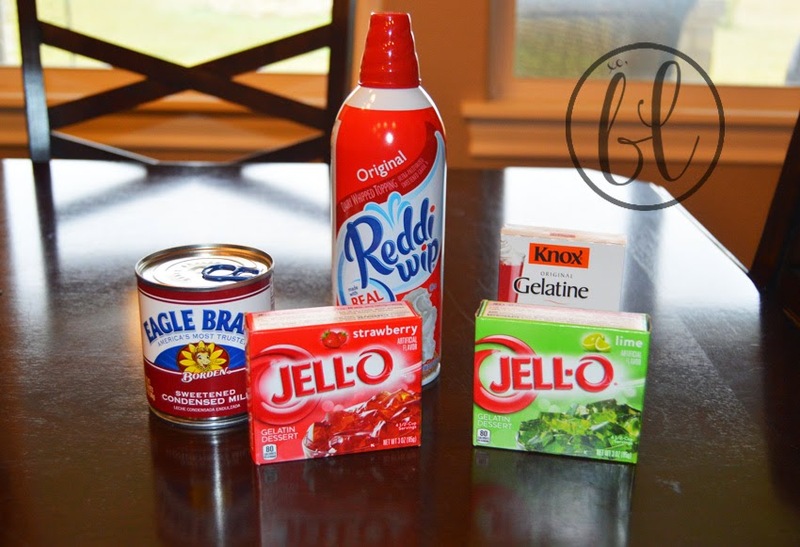 Then add one box of red jello and immediately after, add 1 cup of boiling water. I boiled three cups of water total to use for the entire recipe and it worked well. Stir until everything has dissolved. Then, add 3/4 cup of vodka if doing the adult version. If not, add 3/4 cup water instead. Stir and set aside. Sprinkle half an envelope of unflavored gelatin over 1/4 cup of water. Allow it to soak for a minute. 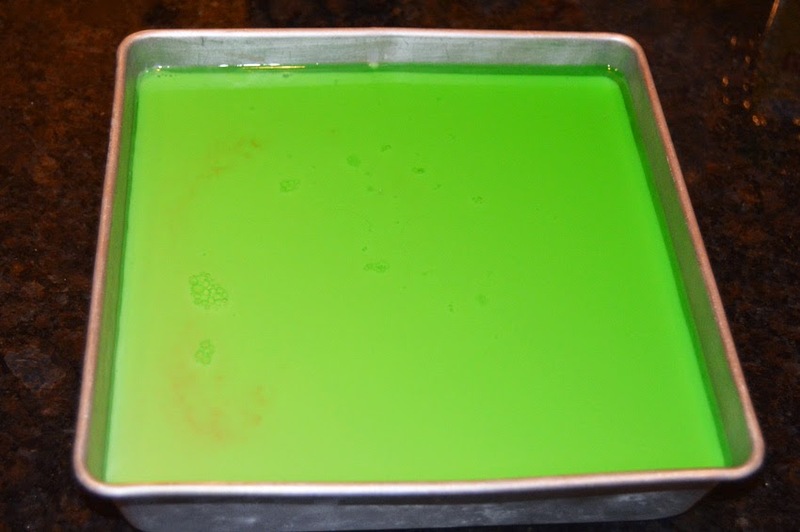 Then add one box of green jello and immediately after, add 1 cup of boiling water. Stir until everything has dissolved. Then, add 3/4 cup of vodka if doing the adult version. If not, add 3/4 cup water. Stir and set aside. 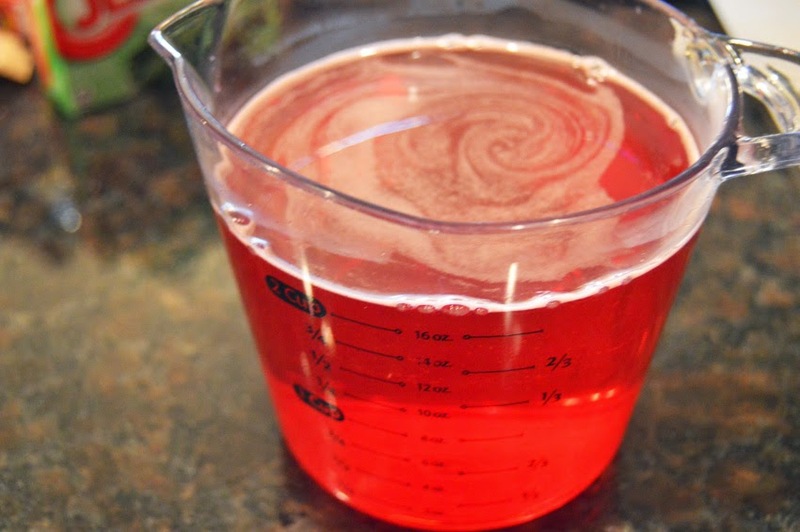 Sprinkle two envelopes of unflavored gelatin over 1/2 cup of water. Allow it to soak for a minute. Then, pour in one cup of boiling water and a 14 oz can sweetened condensed milk. Stir until everything is dissolved and set aside. 3. Pour half of the red mixture (about 1 cup) into the prepared dish. Place into the refrigerator for it to set for 25 minutes. To determine if it’s set enough, press down lightly with your finger and it will feel solid. Once it’s set, move onto your white layer. 4. Pour 1/3 of the white mixture (about 1 cup) over the red layer. If there are any air bubbles with the white layers, do your best to pop them! A toothpick works pretty well for this, but it was definitely my least favorite part of the entire recipe. Then place in the refrigerator and allow it to set for 25 minutes. 5. Repeat the process with half the green mixture (about 1 cup). Then white, then red, then white again, and finally green. You’ll end up with SEVEN layers total. You can always add more layers if you’d like, but the amounts given are for seven layers. If any of your mixtures start to solidify (the white will, guaranteed), just pop it in the microwave for a few seconds, stir, and allow to return to room temperature. The room temperature part is extremely important so it doesn’t melt the layer under it. If it does (mine did a bit), you’ll end up with a creamy mixture of the two colors in some spots. But if that’s the look you’re going for, then by all means, have at it! 6. After all your layers are added and each have set, place the dish in the refrigerator for 2-3 hours or overnight. I let mine sit for about 3 1/2 hours and it definitely could’ve gone another 2, if not just overnight. The longer the better! 7. When you’re ready to serve it, pull the edges away from the pan (I used a butter knife) and invert the entire dish on a cutting board. 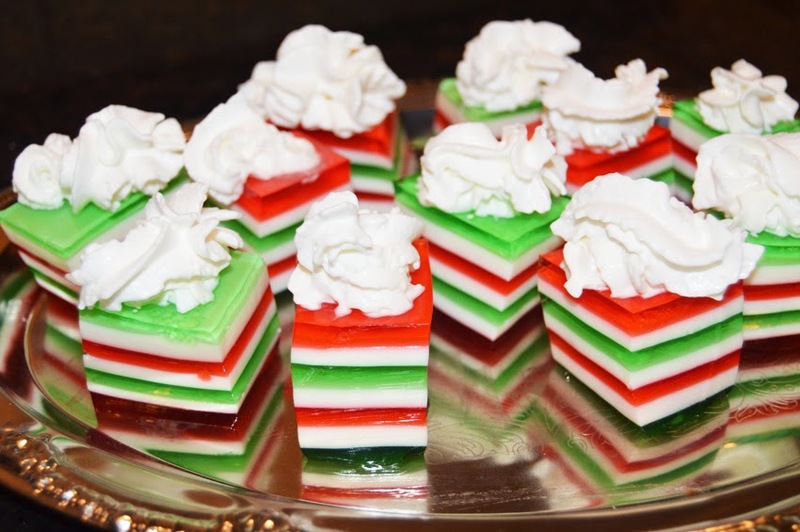 Then cut into squares and top with whipped cream! Original recipe found at tablespoon.com. Wow, what an unbelievable whirlwind these past two weeks have been! And I still have one more week of vacation this week … so you better believe that this is one happy girl over here! This past week in particular has been a blessing for sure. I had no major plans, Christmas was low-key, and I spent all my time with loved ones. I also stepped away from social media, blogging, photography – everything. And you know what? It was amazing! It was nice not to worry about deadlines I set for myself or documenting each and every moment of every day. I lived in the moment and soaked up every minute with my family and friends. I am so unbelievably blessed, and it was amazing to focus on the true meaning of Christmas and to soak up the blissful memories with love that I’ll cherish forever. I sat here staring at a blank screen for a while, trying to jump back into the swing of things, explaining what I did for Christmas, what I enjoyed doing, what the moments of those days looked like, and then I thought, “Why?”. It was boring to write out because it was just spending time with family, enjoying the louder laughs, longer hugs, and delicious food. Who wants to read a post on just that? Nope, no one. And then it hit me, I enjoyed being away from technology. I enjoyed living in the moment. I enjoyed my unexpected hiatus from Facebook, Twitter, Instagram, Pinterest, blogging, and having a camera strapped to my hand at all times. It was nice and definitely much needed this Christmas. I don’t have a million pictures to throw into a post. I don’t have a million Facebook statuses to recall the memories. I truly enjoyed my first “divorced” Christmas and I am unbelievably thankful for it. And just like that, Christmas 2014 is over. The celebrations have come to an end, decorations are being taken down all around us, the music has stopped, and the hustle and bustle has died down. Now let’s just see what the last few days of this year holds! I’m excited to find out :).